Mayor says: " We're going to tunnelise the flyover"
Hammersmith Flyunder "Could Take Just Three Years to Build"
Architects Present their Vision of "Flyunder"
London Mayor Boris Johnson is backing plans to demolish the Hammersmith Flyover and replace with a tunnel, or "Flyunder". He said that doubts over the scheme have been quashed following a meeting with Hammersmith and Fulham Council, which showed that around £1billion worth of former highway land could be freed up for development to help pay for the flyunder works. Speaking on radio station LBC he said: " A presentation came in from Hammersmith and Fulham. They’ve been working for months on this idea of creating a new town centre in H&F.
" We’ve been listening to this for months and months thinking come off it this is never going to work and actually it is brilliant.
" It adds up. It’s a most fantastic scheme. We’re going to tunnelise the flyover. The Mayor added: " What was interesting was even the hardened TfL engineers looked at all this – they’ve been very sceptical – and they thought it was a great scheme." 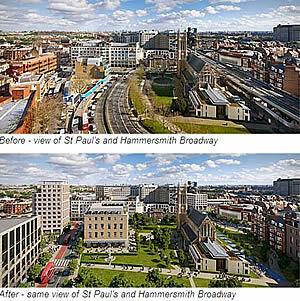 The Mayor's support comes as new artists' impressions are released of how Hammersmith Town Centre would look if the flyunder was built. The three alternative tunnels in the council’s interim study, which is set to be finalised and published later this month, vary from 1 mile to 2.5 miles long and are likely to cost between £218m and £1.7bn. The shortlist option would involve digging a ‘cut and cover’ tunnel 15 meters beneath the surface just opposite Furnivall Gardens in the west and Hammersmith & West London College in the east. The council says the flyunder would act as a catalyst to transform Hammersmith’s divided town centre and could be self-financing although TfL now needs to take on the next stage of the project as they own and manage the A4. Cllr Nicholas Botterill, H&F Council Leader, said: “In one move we could tear down Hammersmith’s Berlin Wall, reconnecting our divided town centre in the process, and make our town centre an even more attractive place to live in, visit or do business. 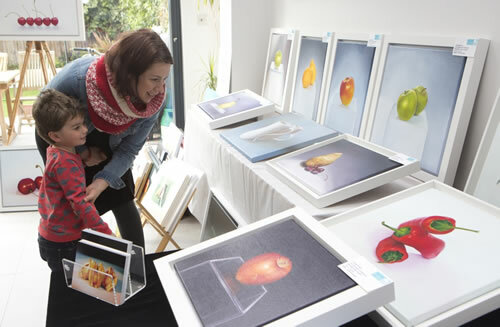 You can find find out more and see more artists' impressions produced by West London Link, a group of local designers and architects at the council's website.